Stock Market Apps – It is essential for the stock market investor to stay updated with the latest stock market movements. It helps them in taking a timely decision about buying and selling. One of the most popular way of tracking stock market movement is via App. Stock Market App helps investor and trader to stay informed about stock market. From checking the livestock price, tracking your portfolio, viewing a stock chart, getting market news to tracking mutual funds NAV; everything is accessible on the move via an app. There are numbers of apps available in the market. In order to help you here is a list of 10 Best Stock Market Apps for Investment Tracking. For better understanding, I have divided these apps into two parts. All apps given in the list are free and easily available for download. MoneyControl is one of the best stock market apps for the latest stock market news, update, and portfolio tracking. MoneyControl is easy to use app for the stock market. If you are planning to keep only a single app for stock market MoneyControl is highly recommended. This app provides complete coverage of BSE, NSE, Futures, Mutual Funds, and Commodities. Single search bar with voice search for stocks, indices, mutual funds, commodities etc. Monitoring your portfolio across Stocks, Mutual Funds, ULIPs, and Bullion. A personalized Watch list of stock and mutual funds with an alert facility. 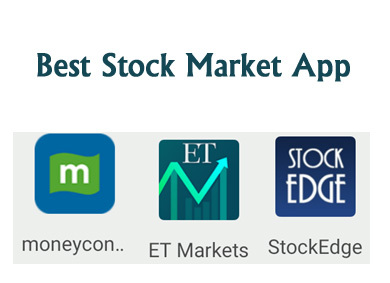 ET Markets is one of the best stock market app for portfolio tracking. I am using this app for getting stock market updates and news. Complete coverage of stock indices BSE, NSE, Mutual Funds, IPOs, Gold, ETF, Forex etc. Follow your favorite stocks, mutual funds, commodities, indices, currencies by creating a watch list. Investment and saving calculator including income tax calculator. Available in multiple regional languages. Easy to track stock and mutual funds portfolio including e-mail notification. Stock Edge is one of the best stock market apps famous for research and analytics. You can do all types of research such as fundamental research, technical research, and derivative research using this app. Key features of this app is given below. Daily Updates Section for filtered major market tracking with News, NSE & BSE Corporate Announcements, Forthcoming events. Stock Research with various charts. NSE Mobile Trading app is one of the best stock market apps in India. This app provides real-time streaming quotes, charts, market depth and the ease to trade. This app also facilitates Portfolio and Holdings Tracking. Key Features of This app is given below. Simple user-friendly interface for all types of users. Trade across all asset classes equities, derivatives, currencies, commodities. Investar is one of the best stock market app for Technical Analysis. Simple navigation and interactive charts with zoom features is the best part of this app. Real-time data and chart updates for NSE Stocks and F&O. Basic and advance technical chart indicators. Price Alerts and push notification. Stock Watch is the most comprehensive and highest rated Indian stock market app for BSE and NSE. You can get the latest stock market update and event info from this app. You can also keep track of your stock portfolio with stocks watch list. Stock Tips from leading stock market experts. Track leading fund houses and their analyst views on a specific stock. Customized stock watch list on the move. Get a snapshot of leading global indices in one place. Market Mojo is algorithm based app for the smart investor. This app provides pre analysed information on all stocks and price movement. It also provides broker recommendations and a lot of other technical information about stock market. Key Features of Market Mojo is given below. Pre Analysed Information on all stocks. Portfolio analysis with risk evaluation. myCAMS is the best mutual fund app. It gives complete information about your mutual fund portfolio in the dashboard view. You can even purchase, redeem, switch or setup SIP using this app. myCAMS supports multiple mutual funds. You can create a watch list or add transaction in the favorite list. It offers a facility to view PAN level portfolio. You can view your complete family portfolio using this app. This app offers enhanced security by using two-factor authentication. PayTm Money is a comparatively new app. The prime purpose of launching this app is to enhance investment in mutual funds via this app. It offers zero commission platform for investment. You can track and manage your mutual fund portfolio using this app. You can even automate investment by setting up SIP using this app. It also provides the facility of smart power search and filters. KFinKart is mutual fund app by Karvy. This app allows you to make an investment with a single touch. You can view your investment and transact easily via this app. You can even link and track your family portfolio using this app. It provides dashboard view with folio level account statement facility. It also comes with NAV tracker for tracking mutual fund performance.